So yesterday was the big iPad pre-order day, and it sounds like lots of folks around the web were eagerly waiting to give Apple their money in advance for the upcoming iPad [Product page]. We we’re in that group of people, though not necessarily just because we like to give Apple money. We wanted to be sure to bring our readers coverage on this device which will inevitably be (and already has been) an influence on the tablet boom that we’re seeing. If you’d like to pre-order your very own iPad, Apple is now ready and willing to take your money. We should be getting ours on April 3rd, so be sure to stop back and check it out. 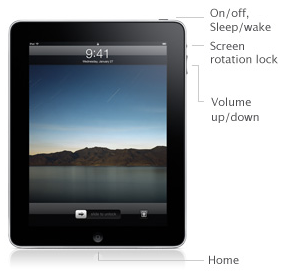 One new bit of info on the iPad front is that the switch on the side, above the volume rocker — that everyone presumed was a mute switch — is actually an orientation lock. If you’ve ever used an iPhone or iPod Touch in bed or while laying on a couch, you’ll know that it can be annoying if you want to lay sideways and read the page. The screen will auto-rate to landscape view, despite the fact that you want it in portrait. So it’s good to know that Apple added the switch to lock the auto-rotation for these sorts of situations.